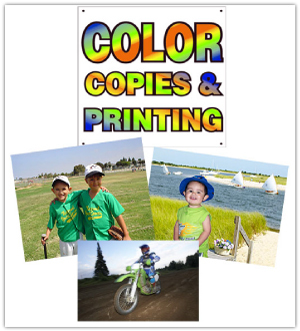 CV Graphics specializes in high quality digital color copies. We can print full color copies or black and white copies from your disk, or we can make digital copies from a hard copy. Graphic design companies, corporate marketing departments, consulting firms, and small businesses in San Diego depend on CV Graphics to provide their businesses with the very best color copies available. Your printed material is a reflection of your own business, so don’t take a chance on sacrificing quality. Documents printed in color not only look better, they work better. Color can be the difference between yes and no, profit and loss, success and failure. Color documents can help increase your companies revenues, improve productivity, speed decisions, improve quality, and gain customers. CV Graphics print solutions has digital color capabilities to help meet all of your needs. People respond to color; it enables them to make decisions faster, more accurately, and more efficiently. If these qualities are valuable to you, the use of color in your documents can help you achieve your goals in less time and probably for less money than you might think. With a variety of computer connectivity and networking options, we can print many files from a variety of applications like Illustrator, In-Design, Freehand, Photoshop, and any Microsoft Office applications. However, PDF’s are typically the easiest way for us to receive your files. Contact us today to get a quote on your upcoming project.